The old Benjamin Franklin quote that “in this world nothing can be said to be certain except death and taxes” is generally thought to be relating to each individual. But in its wider context, death also comes to everyone in our circle of family, friends and in the domain of well-known persons (Where were you when President Kennedy was shot?). There is precious little we can do about reacting to our own passing; after losing those around us, there are all manner of mechanisms to cope. However, with a sudden exit or demise of one “far too young,” survivors find themselves at wits’ end. Some cope through artistic expression, writing for example; others, should they be fortunate enough to have the capability, can wordlessly bid adieu using our most universal art. Structured in frequently linked sections, composer/trumpeter Douglas Detrick’s The Bright and Rushing World explores many aspects of human existence using a distinctive sound that, consequently, opens its own door to a world of possibility. Detrick painstakingly ensures that every AnyWhen perfromer is allotted equal opportunity but allows his own singular instrumental voice key moments to speak—notably the improv/cadenza-like “opener” and most especially the muted contributions in “You never thought to give a name” where emotions run high and echoes of muted Miles Davis only add to the effect. The last gasp at a recurring ostinato (“On the wind of his leaving”), is quite correctly in Detrick’s domain before the ensemble quietly, reverently completes the journey. Saxophonist Hashem Assadullahi does a fine job blending with his colleagues or leading (“Into the bright and rushing world”) with authority. His searching, searing interjections—nearing “frantico”—in the later part of “A question so weightless it floats away” are unforgettable. 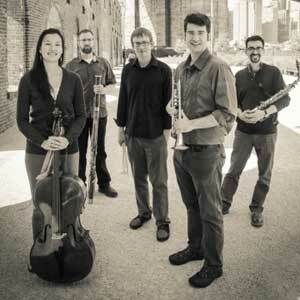 Successfully bridging the realms of chamber music and jazz (save and except for some overly active key clacking: the bane of close micing), bassoonist Steve Vacchi provides a solid foundation and engaging melodic style (both can be heard to advantage in “A seeker, unsubmissive”); the double-reed colour infusing much richness to the CD’s aural spectrum. Cellist Shirley Hunt demonstrates an excellent ear for balance—particularly with the saxophone and bassoon as they combine for unison or more chordal/chorale-like moments. Only very infrequently did the three disparate instruments lack unanimity of attack—a remarkable achievement in itself. The opening of “You never thought to give me a name” has a wonderful combination of other-worldly “voice” marvellously brought back to Earth with ideally contrasting melodic lines. Gluing much of the music/soundscape together—and with a stellar approach to employing the brushes in a most non-percussive manner—drummer Ryan Biesack keeps the subtextual pulse beating steadily forward (“Who, over years in your care”; “You gasp and ask aloud”) and equally effective skin (real and toms) interventions as required. How can you live without a name?